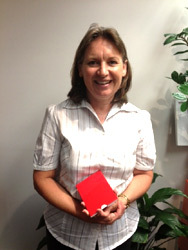 We awarded Jan with a voucher from Westfield for her great efforts – well done Jan! Jan Dickinson has been temping with DCL since 2011. Over this time she has held a number of both short and longer term assignments. Most of these assignments she made her own and ended up staying far longer than the initial time frame requested due to her diligent and hard working nature. Comment from one of her managers……… "Jan is a fantastic temp nothing phases her she just gets on with the job at hand. She asks for extra work and is always happy to do whatever is required of her, which is a wonderful addition to our team. I wish we could duplicate her"!!! !